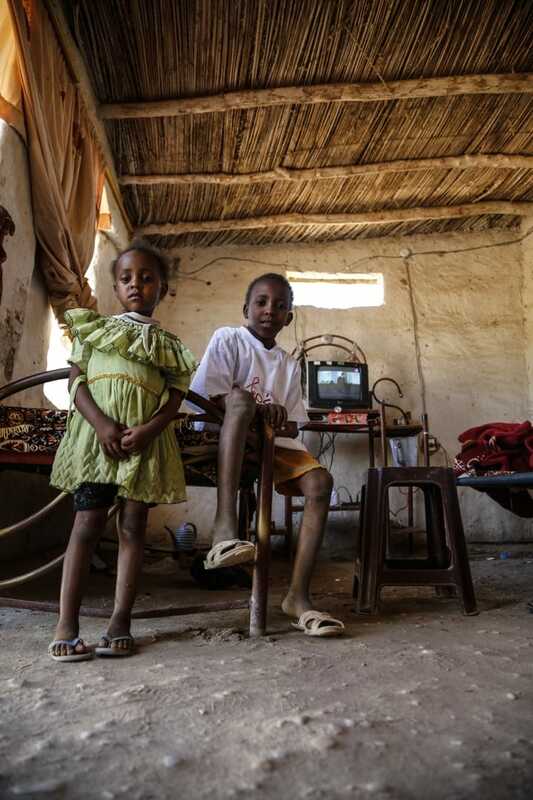 Sudan is a country with extremely friendly, hospitable people, but a government of authoritarian regime. 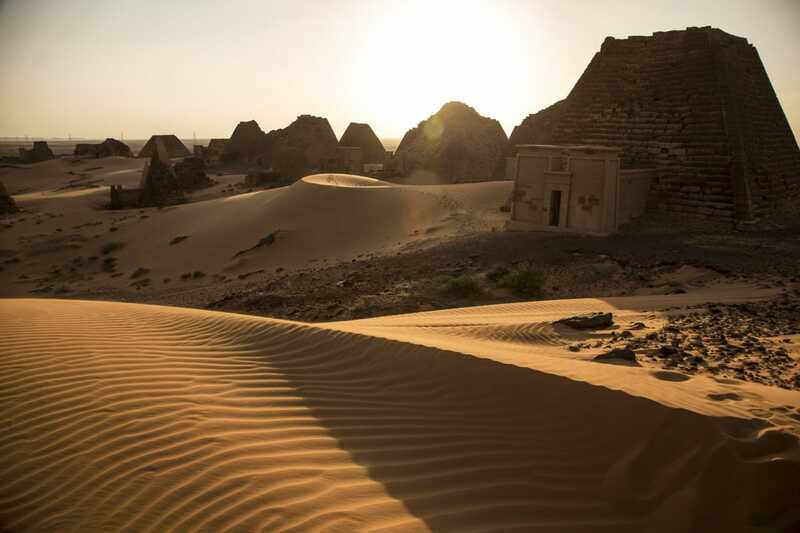 A country with a great cultural heritage and historical monuments of the ancient kingdom of Nubians, with enchanting ancient pyramids but no tourist infrastructure. 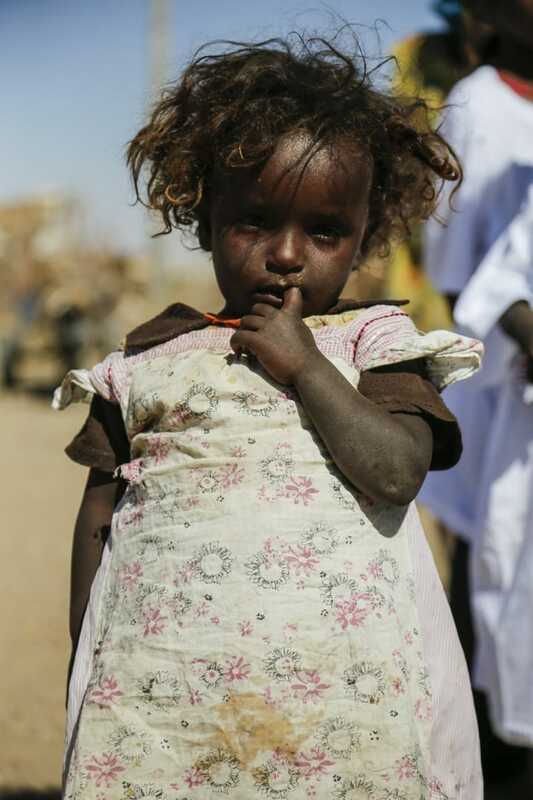 Sudan is always in a state of isolation, has been a terrorists’ shelter, including Osama Bin Laden’s, has been accused for the genocide in Darfur, while the United States classify the country on the axis of “evil” by implementing a permanent embargo (revoked in 2017). 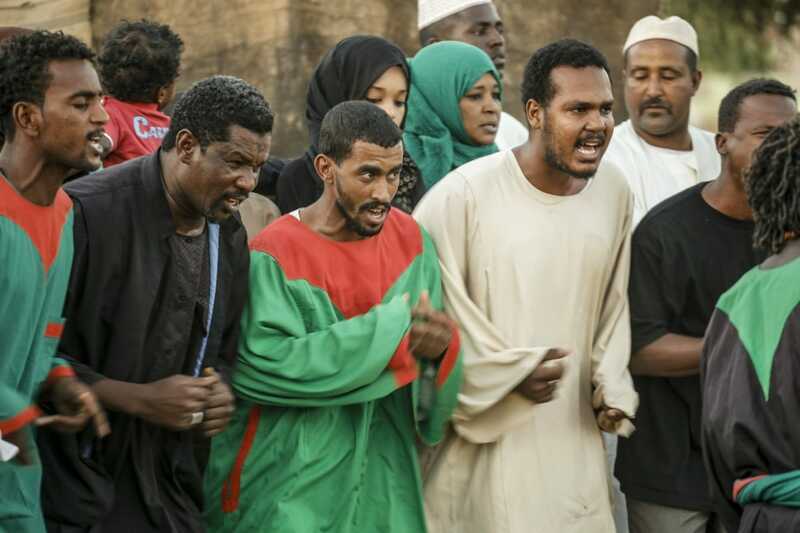 An independent trip to Sudan is not easy. Public transport does not serve the country’s main destinations and main attractions. If you choose to drive by yourself, you have to experience chaotic traffic conditions in cities and non-existent desert roads, but you will experience an unforgettable experience. 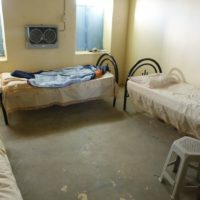 In a country with no tourism, where hotels are often worse than prisons and… there are chances you’ll experience also the real ones. Personally, I was arrested twice for taking pictures, without further trouble. Welcome to Sudan. 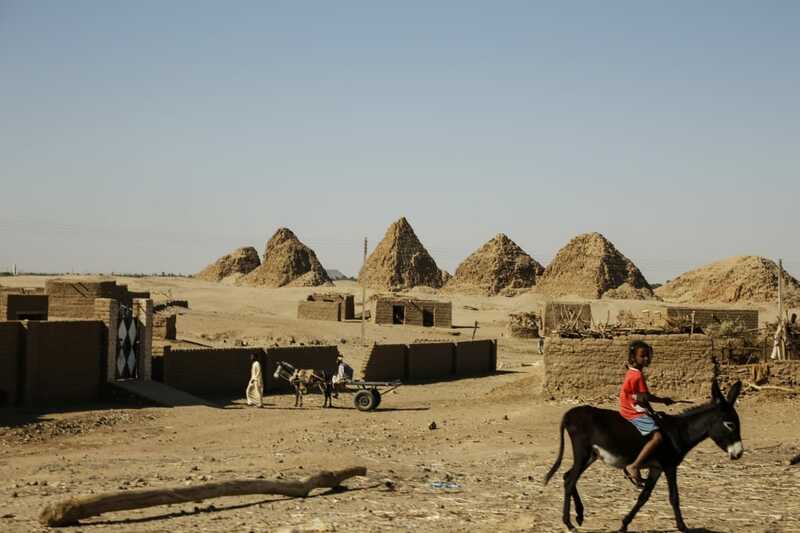 Free camp on the roof of an ancient pyramid, wander in ancient cities without any tourist in view, dare to drive in chaotic conditions, between trucks, tricycles, hand trucks, carts, camels, get lost in the desert routes and discover magic places that few foreigners have found. 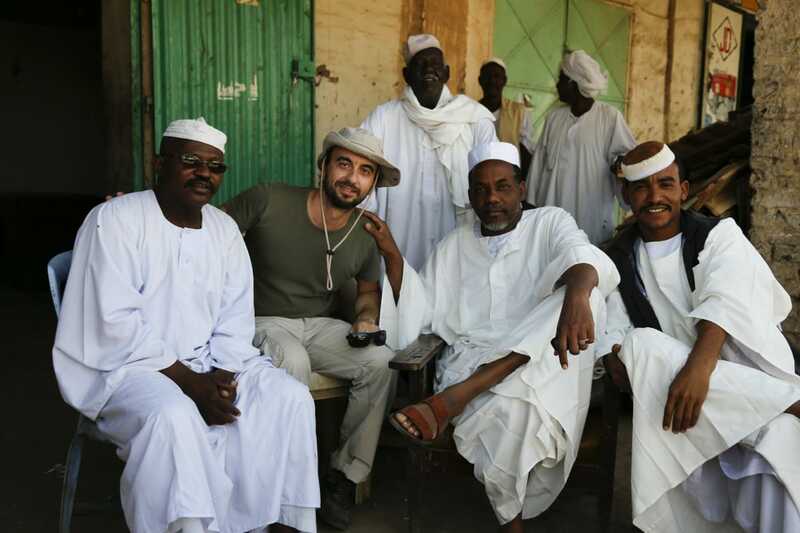 As it usually happens in places where tourism has not affected local lifestyle, a visitor in Sudan will meet very authentic people. More than that, in countries where a repressive regime restricts citizens’ freedoms, the availability of contact and communication with the “stranger” becomes even more in need. Unfortunately, as in any dictatorship, there are also informers and implementers of the regime. 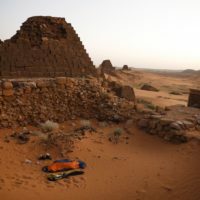 From capital Khartoum, a city of contradictions, to Omdurman with the largest street market in East Africa, to the mysterious archaeological sites of ancient Nubia such as Meroë, Naqa, Kerma, Old Dongola, Nuri, the traveler will meet deserted places of unique beauty. Tourist infrastructure is minimal. 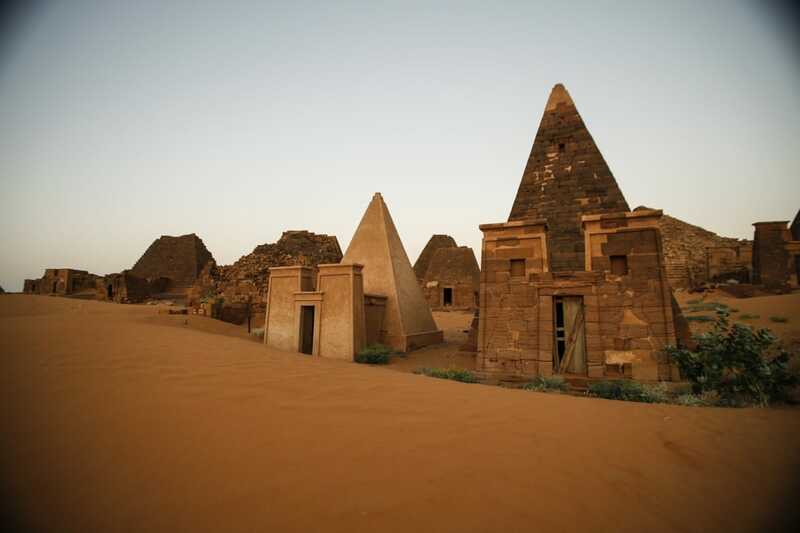 After all, Sudan is a journey for travel fanatics. At the Sudanese Embassy in Athens, waiting for the long-awaited visa, we met N. When and told him that we were going to Sudan for holidays. He replied that we must be “totally crazy”. He, a financial immigrant from bankrupt Greece, went to this inhospitable but profitable country to set up a business. Unfortunately, the Greek community in the country not only did not support him, but also made sure he was accused for minor offenses punishable by whipping (possession of alcohol) and imprisonment (documentary irregularities for equipment imports). 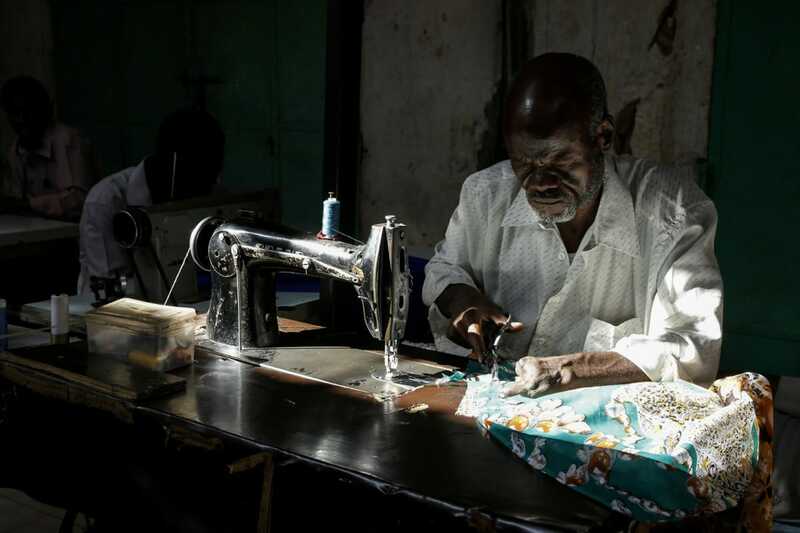 Arriving in Khartoum, we didn’t see him much because his business duties kept him very busy. Among his useful advice was not to dare to exchange currency on the streets and to be careful with women. The laws of the country are very strict. 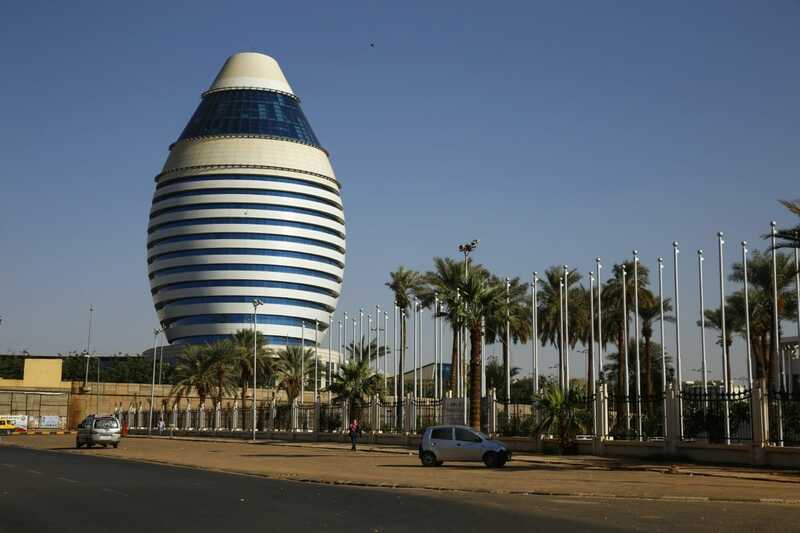 Khartoum is a city built on the junction of the White and Blue Nile, the two tributaries that originate in Uganda and Ethiopia respectively. 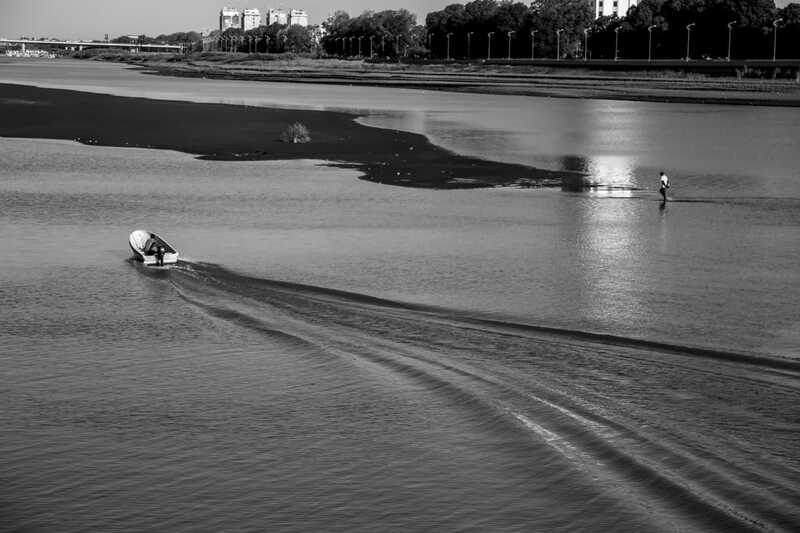 From here, the longest river on the planet continues its journey, ending in the Mediterranean Sea. The hotel recommended by N was not quite cheap for our budget, nor did it have any sense of luxury, but we decided stay for one night as it was in a good location. We got a local SIM card on street vendors, easily and without any registration. 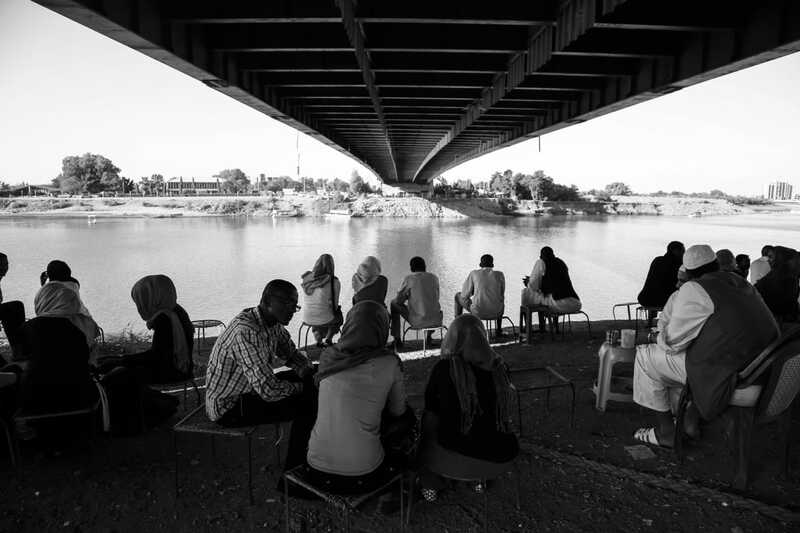 Using taxi or tuk-tuk you can visit the river just before the confluence of the two tributaries and the large bridge leading to the opposite side and the twin town of Omdurman. Along the river there are many riverboat-restaurants and cafes. They were almost empty at this hot evening time and most people were on shore, among them, students who were thrilled to chat with us, the only tourists around. The girls were social too and did not show any particular religious shyness in our conversations and photos. The sunset gave a golden-red color to Nile’s waters and a magical serenity. In the evening we will dine in a restaurant near our hotel, with an awful menu including some disgusting fried chicken. Every restaurant serves fresh wall-rocket leaves that if you are bold enough (I was) you can try. Bread baguettes in a plastic container with a cover that protects against the countless flies are also a base serve. I asked for forks, but the reply was: “finished”. In the next few days I will understand that restaurants do not have forks and their use is to replace by hands and bread. The next day, we have important things to do, with the most important finding out transportation. 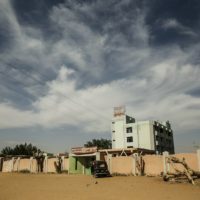 It is not easy to find rental cars in Sudan but for our great luck, next to the hotel is the an agency with a polite owner named Abu Harba. This noble gentleman showed understanding in our hard bargain and gave us a brand new 4X4 pick up vehicle. 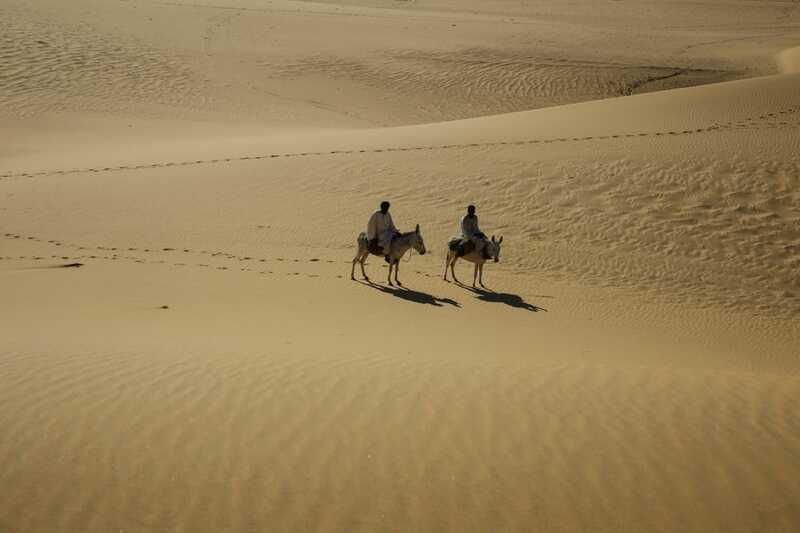 It was the only company to rent 4×4 cars to tourists, since there is also a limitation from the government for who can roam around the unattended vast desert areas. 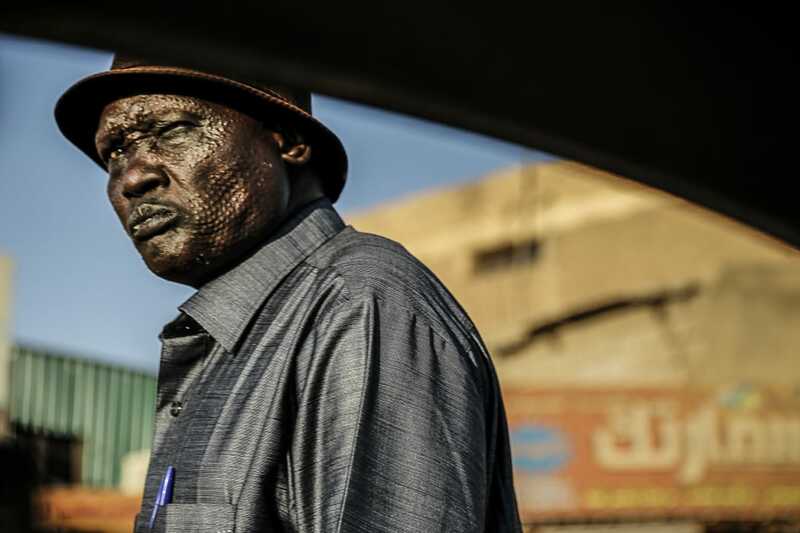 He told us not to dare to go to the south, on the border with troubled South Sudan, and showed us on the newspaper some recent incidents about shootings of passing vehicles. Of course, in remote Darfur we are not allowed to go either, also for many other areas it needs a special permit from the ministry. Before we picked up the car, we had to get air tickets for our next destination, Addis Ababa, Ethiopia, from where we would head to Somaliland. Tickets with Sudan Air cost half the price of Ethiopian Airlines but could not be booked online, the company has a bad accident history and a flight ban in European airspace by IATA. Eventually the tickets cost much less than I expected, to a degree of concern about the validity of the handwritten pieces of paper that only mentioned our names and not the surnames! A few minutes after leaving the office, my phone rings to be informed about a price error. We came back paying the small difference but again it was much cheaper than expected, which prolonged my concern. We got into the car but since my international driving license has expired, my traveling companion takes the lead in the chaotic Khartoum and I help as a navigator. We return to the airport where we are obligated to register (within three days after arrival) our passports, getting a sticker that occupies another half page and raising the cost by about € 25. Please note that visa issuing at the Embassy of Athens requires a Letter of Invitation (LOI) issued by one of the few tourist agencies in Sudan. Presumably, the office I found didn’t asked for money! Bureaucracy, however, goes on. In order to be able to take photos legally, it is necessary to issue a permit from the Ministry of Tourism. We headed in there but the time was past and the ministry closed. Without having much time, we decide to take the risk of illegality and start our journey to the north. We supplied water and cookies and left behind the mess of urban chaos, we are following a straight road that crosses the desert to the north. Straight roads makes you drive fast and we hardly imagined that on a road with old trucks and donkeys, the police are catching up with a state-of-the-art speed radar. So we had to pay a fine for exceeding the speed limit. After about 200 km we we arrive in the city of Shendi. 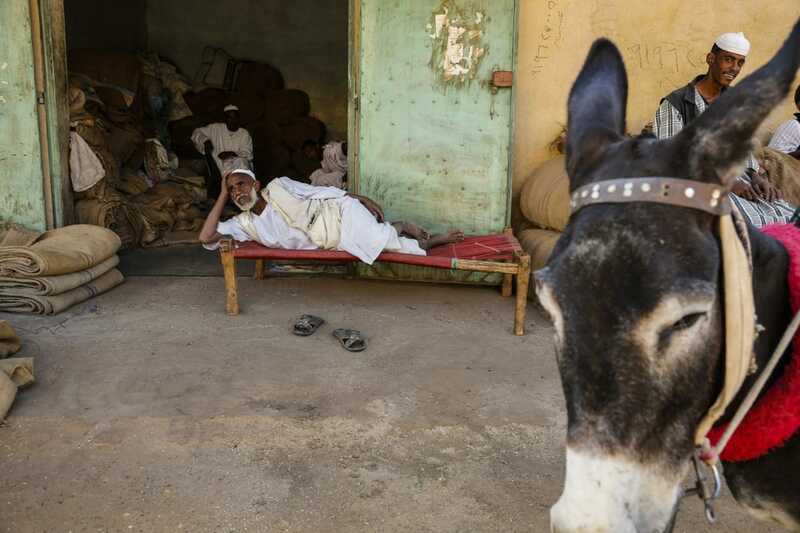 A small, dusty town with donkey carts on the streets, and a street market. 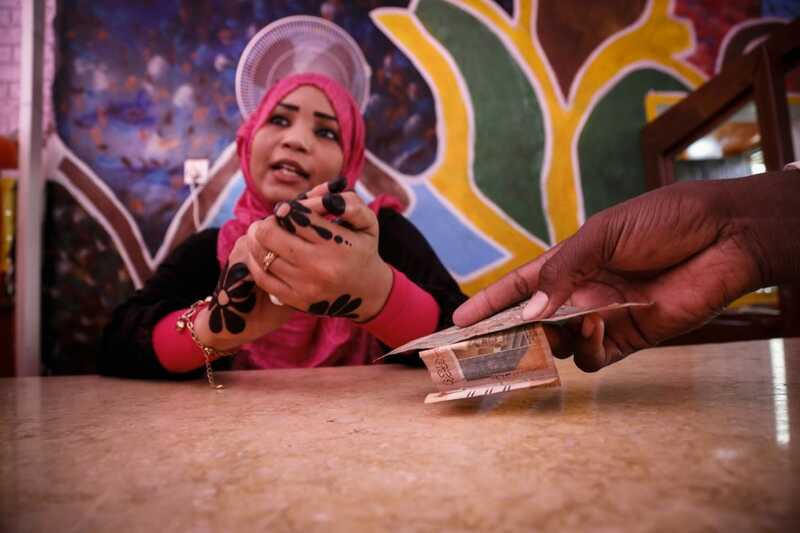 Like most of the country’s cities, it’s near the Nile river. At Shendi there is only one hotel that seems time has stopped ages ago. The building is almost deserted. We unload the luggage and walk around the dirt roads of the city. Naturally, we are the focus of locals’ interest. 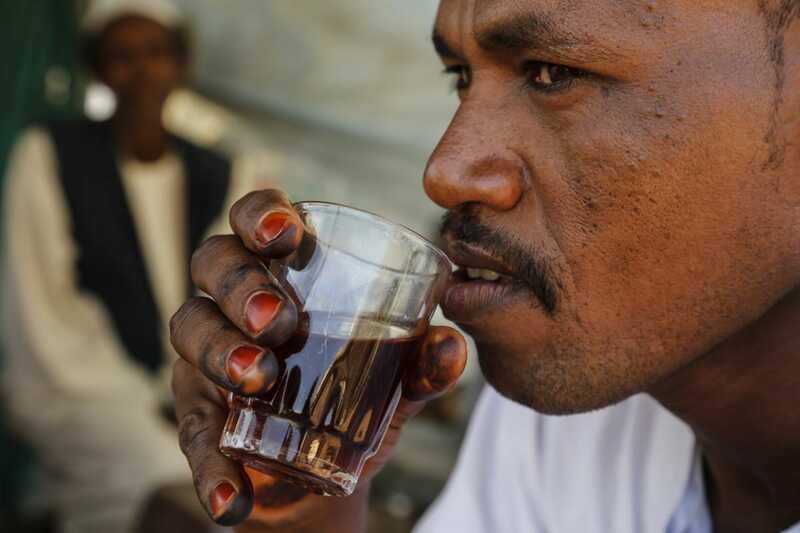 Everyone wants to talk to us, swap a handshake, get pictures with us, offer us tea and… smiles. The feeling of friendliness and hospitality is intense, expressed from peoples’ faces that are so different from ours, that at a first glance may seem strict, distant, hostile. At some point, while we were wandering around and photographing, someone approached us, and in intense style, he demanded us to follow him. At first I thought he was inviting us somewhere, but it was finally a security officer who led us to the police station. The commander of the department was particularly gentle and cooperative. But we had to answer various verification questions and justify our photographic passion. We have been asked about the photo permit and we falsely replied that it’s no longer required. The chief commander, of course is not stupid and he phones the ministry. He was talking for a long time and we were worried. Eventually we were left free, our nationality may have played an important role, given the strong Greek community in the country. Socialising continued on the next day, in the open-air markets where these poor people offered tea again without accepting money. We continue our drive but the dirt roads of the small town were stiffly blocked by countless trucks, wagons, vendors with their moving benches. Passing through this traffic chaos was impossible, so I went down and assuming the role of a traffic policeman, I stopped everyone for our car to pass. We mark a spot on the GPS trying to navigate in non-existent roads in the desert, searching for the ruins of the ancient city of Naqa. 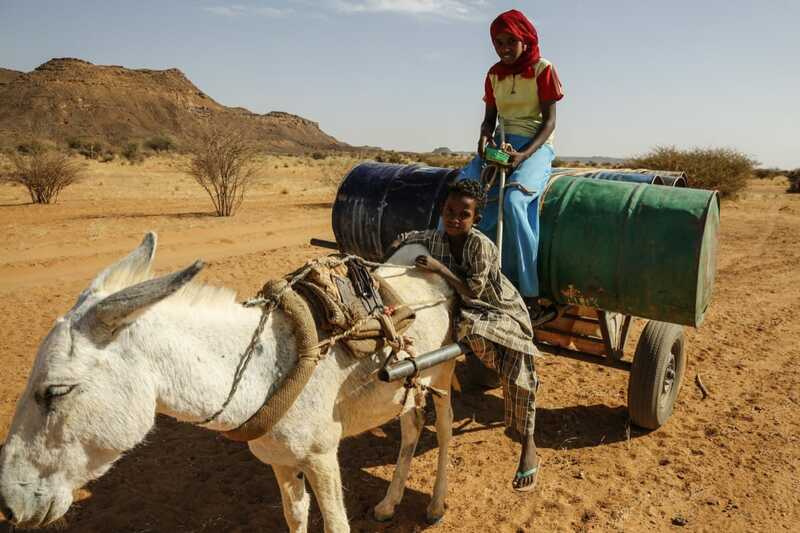 On the way we find few desert camps and people struggling with donkeys to pump precious water from the few wells. In this wilde landscape, there are nomads who give us smiles, young ladies with colorful handkerchiefs, small children who carts loaded with barrels of water. 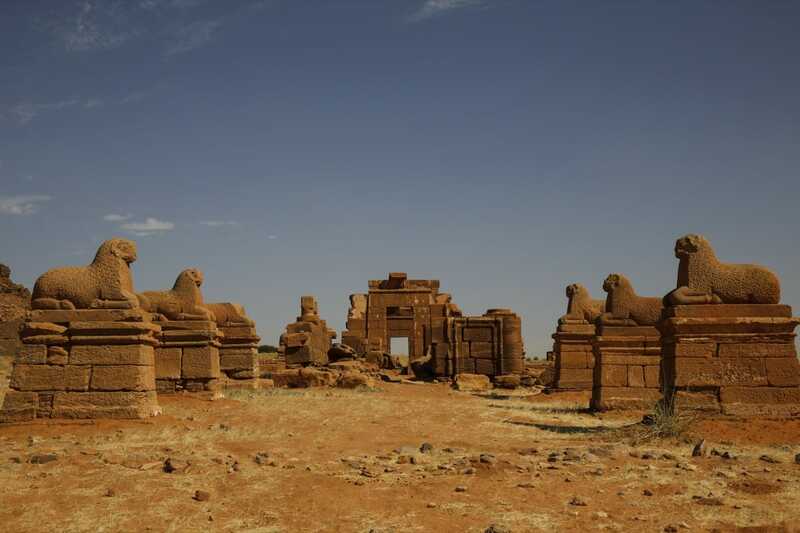 Finally, we arrive at the isolated Naqa with two elaborate temples, similar to those of Egypt, with columns, capitals, embossed frescoes and gates with lion statues. There was no one else there except an old man as guard willingly showed us the archeological site. 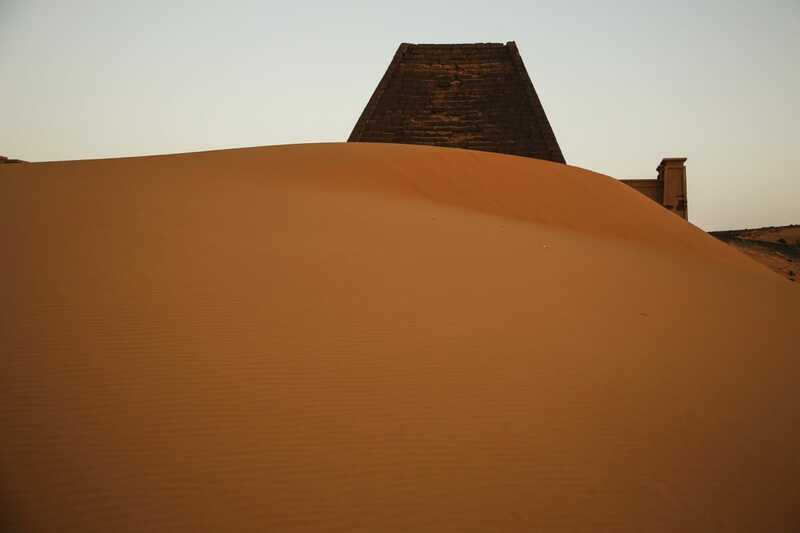 Returning to the main road, we continue further north until we find the first pyramid group on our left hand, and a little later on the right, sand dunes which the dominating, majestic pyramids of Meroë. 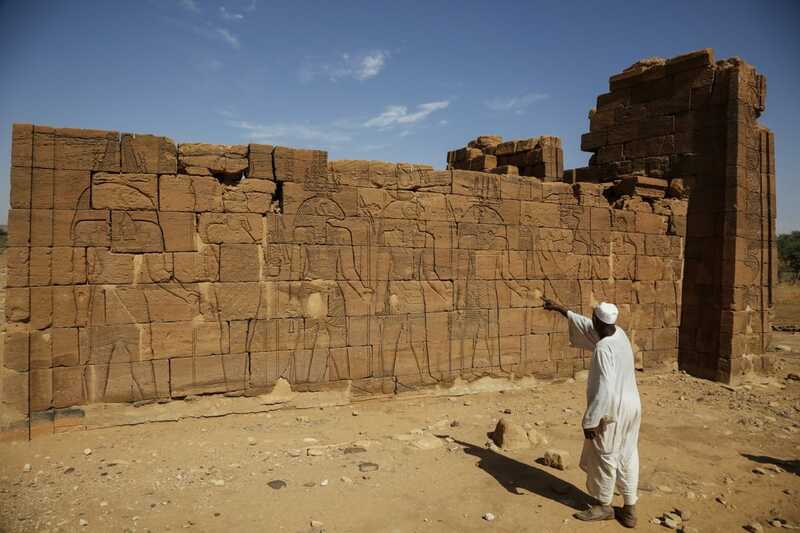 In this area called Nubia, one of the most ancient civilizations in Africa flourished, with traces from 2500 BC. 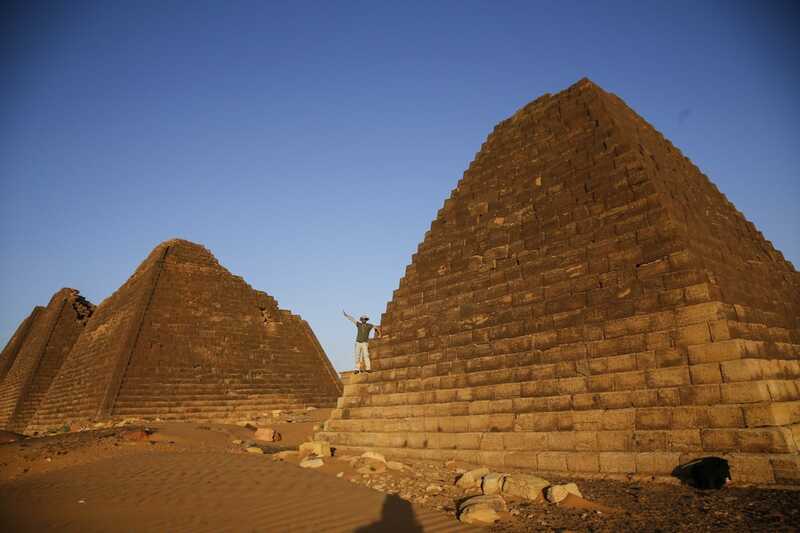 It was conquered by the New Kingdom of Egypt during 1500 BC. 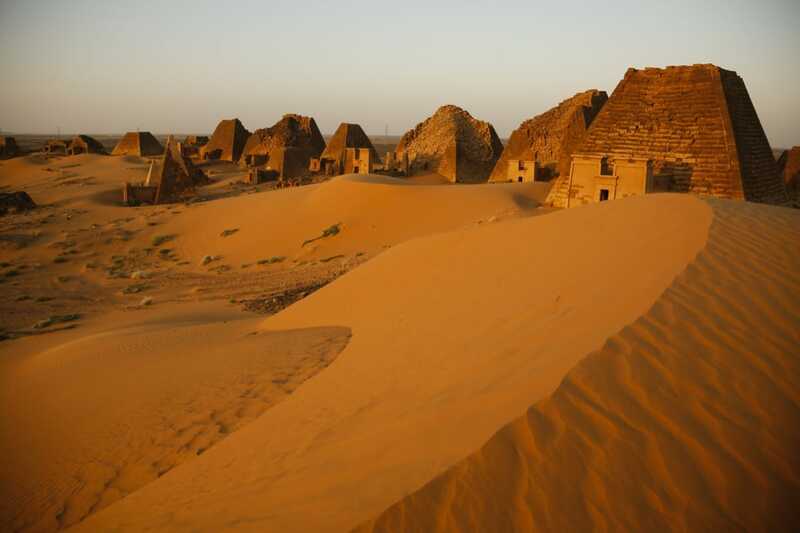 and several centuries later, the Kingdom of Kus was established here, with Meroe’s capital, which in turn overthrew and conquered the Pharaonic dynasty of Egypt. Avoiding the deep sand, we manage to approach it by car. And there is no one except a guard who has interrupted his sleep. The place looks like a movie set. Sand everywhere, no soul lived, and the pyramids, even though much smaller than those in Egypt, stand out through the sand dunes. Their peaks are missing, since an Italian explorer of the 19th century had the bright idea of ​​blowing them up to find treasures … and he found them! We climb to many of them or wander among them, feeling their energy in this exotic environment under the wonderful evening. There is no village nearby for overnight stays except for an Italian owned camping somewhere near. 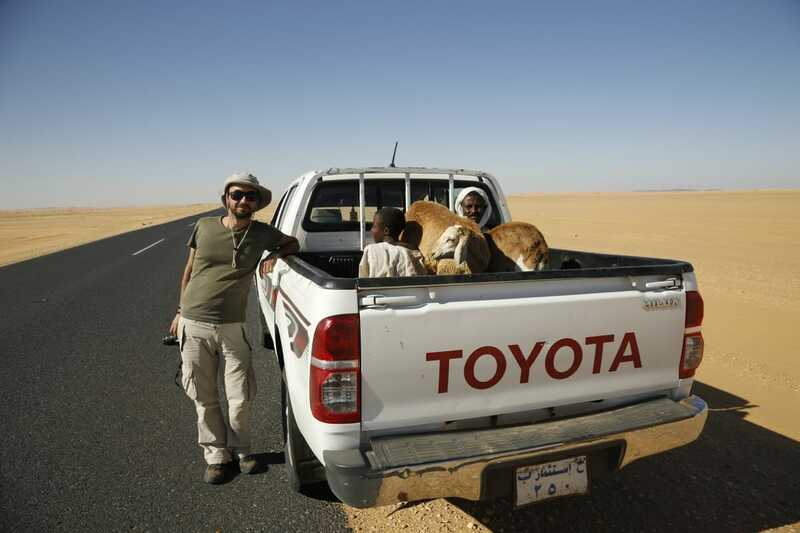 Some local settlements are also seen in the desert horizon, but our idea was to sleep in the car. An alternative that was proposed was the car’s cargo compartment, but was hard as a bed and full of dust and sand. So I proposed the airy “double apartments” that constituted the entrance of the pyramids. I was not satisfied either, because it was quite claustrophobic for living people. Even though the darkness had fallen, I tried to find a pyramid with a proper, flat roof. I found it easily and we started climbing the escalating sides by setting sleeping bags in the sand and ignoring the crowds of beetles. I slept in the most beautiful hotel of my life, lost in the view of the starry sky, the same that inspired the civilizations to build the pyramids millennia ago. The night in the wilderness did not evolve so perfectly. A sandstorm began to penetrate into the sleeping bag, under the clothes and headgear, through the ears, the nostrils, the eyes. Every attempt to remove it was like sandpaper in the irritated eyes while the teeth were rubbing the grains of sand. However, in the middle of the night my sleep came to more disturb as my companion showed symptoms of intense sickness. He asked me to find him urgently paper and water and so I found myself stepping down the pyramid and looking for the car in the dark desert. The sunrise competed in colors and magic with the previous sunset. The food poisoning of my companion finally forced us to make late “check out” of the archaeological site while the shade of the pyramids offered a comforting shelter from the hot sun. Shortly before we left, some local visitors and some camel boys appeared. 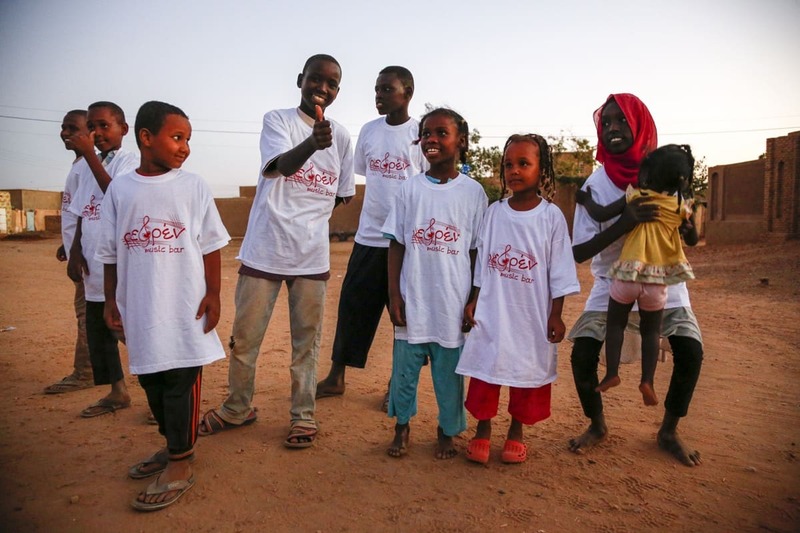 But we have to cover the lost time and the long journey to the north, stopping in the few little settlements and sharing t-shirts to the kids. 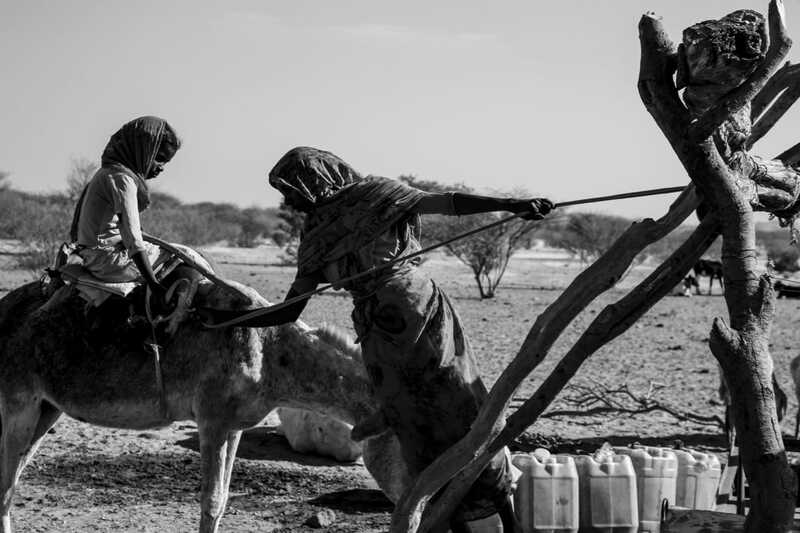 In Atbara, we renew the water supplies for the unknown section of the route that follows. An endless straight road crosses the vast desert. The only thing that rarely cuts off the horizon is some camel caravans. A part of the trunk of a fossilized tree submerges the imagination of the shape of the landscape before the desert dominate. Suddenly, a family carrying two lambs in their arms appears out of nowhere. We stop photographing them and they break out in joyful reactions. It’s a hitchhiking, father and son ask to take them with us … along with the lambs. The car with the cargo compartment proved to be ideal, giving a pleasant experience to us and a valuable service to these people. 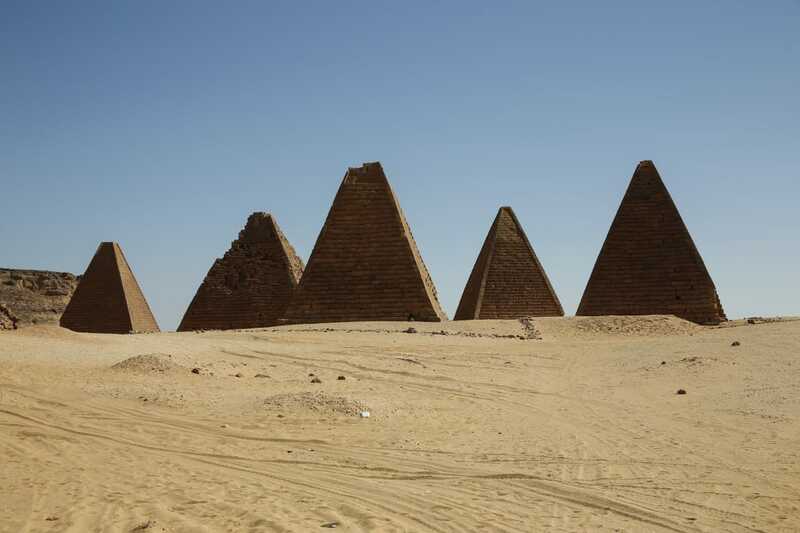 At some point we arrive in the city of Karima facing another pyramid array. 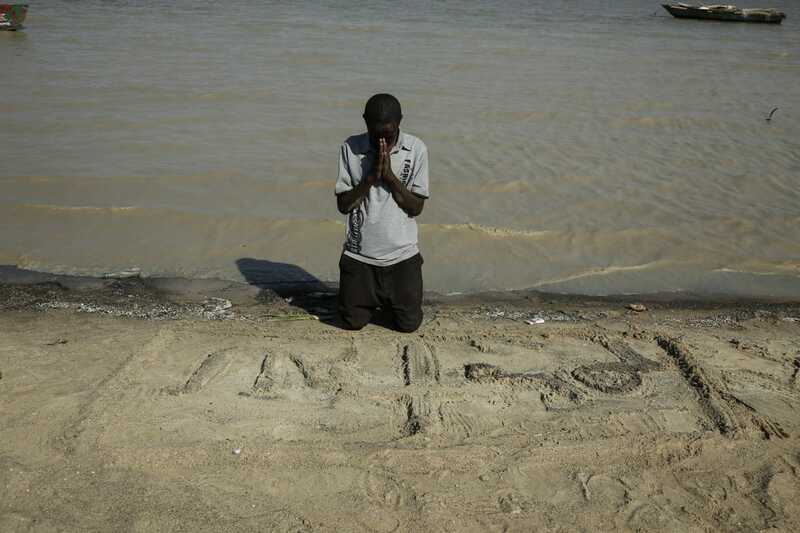 We left our passengers, people and animals, and we searched for accommodation. 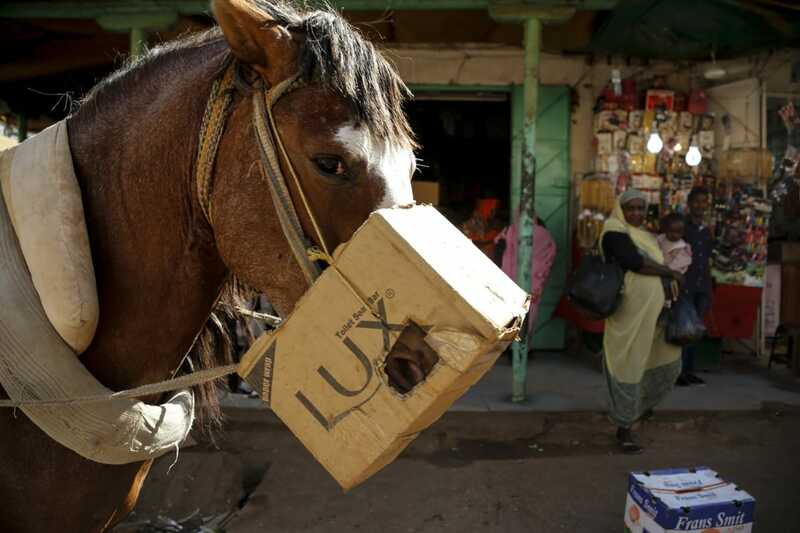 Things in this dusty city were not encouraging. No one spoke English. The first “hotel” was a courtyard with earthy flooring and no roof, with the rope beds instead of mattress and communal conditions with the robe dressed hosts. The seat of the car seemed infinitely more comfortable than that. Our book mentioned about a lodge belonging to an Italian. It was a large enclosed area but none appeared on any door we hit. After much persistence and anticipation, someone replied. The place showed abandoned and the courtyard full of building materials. A large kitchen with inox equipment was long inactive. 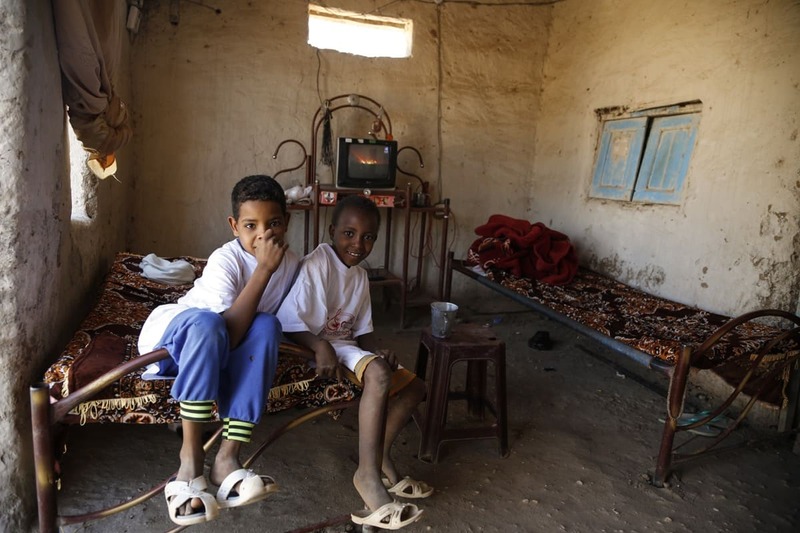 Despite the construction work, some of the many dusty rooms were available. The Italian lady informed us of the price. $170 for a basic double! Did we hear well? Obviously the lady profoundly exploits the lack of hotel stays, no other explanation. We kindly say goodbye to her. In some cases, the book guide is beneficial and this was such an example. The “Bradt” guide had as a last choice the phone number of an old man. I call him, but he don’t speak a word in English. Communicating with body language is somewhat manageable, but trying to explain to an Arabic speaker about what I’m asking for and about the meeting point was a challenge. Finally, the old man appeared in a tricycle and we followed. He gave us a whole house with several rooms. It was dusty and apparently long uninhabited but cheap and quite comfortable. The outdoor bath due to its uselessness was in a satisfactory state for the country standards, even the cockroaches were dead. We put the padlock on the iron door and go out to the city searching for food. The initial impression is tragic. Behind small window displays there were some some black, mummified small fish covered with hundreds of flies. After the travel fatigue and the poisoning of the friend, starvation is not the best thing to happen. 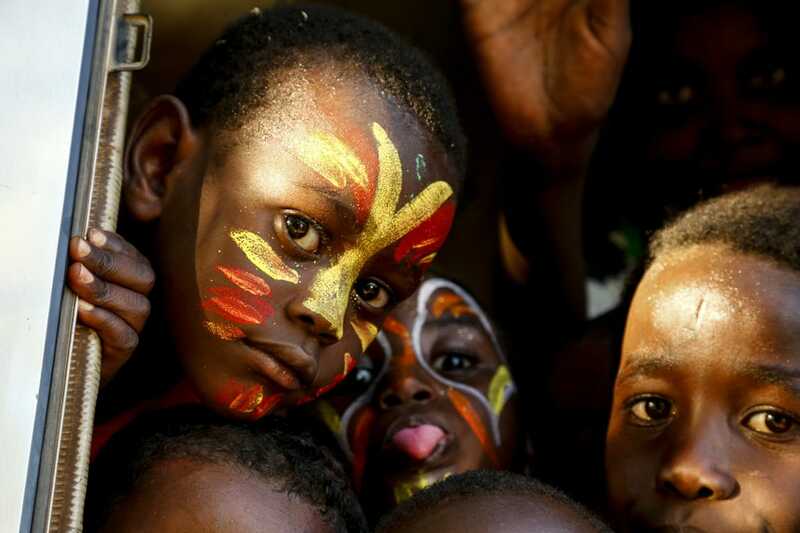 But Sudan has a peculiarity. There are pharmacies everywhere, even in a row next to each other. As is well known, pharmacists around the globe are required to know even a few English. So we ask for their help about a place where we could safely get feed. Indeed, they send us to the best restaurant in the city, very close to the river bank. Here they welcome us warmly, they give us the VIP room of the restaurant and the prominent patrons – including the police chief – are introducing themselves. Huge fishes in human size are hanging on the yard. 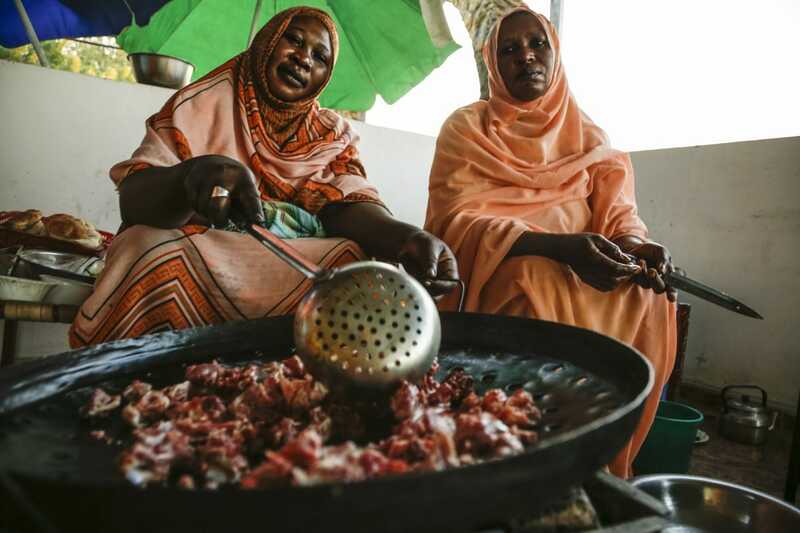 We will try them, freshly fried, as well as delicious meat also fried by two ladies. At such moments I want to drink litters of beer, but only hot tea and cola is available in the country. The young female accountant of the restaurant is exited with our nationality, expressing her future plans for immigration to Europe through Greece. We tried to change her mind about this dangerous journey with the thousands of victims, but the European dream seemed to outweigh the risk. In the morning we will have a boat ride on the Nile with a traditional fishing boat. The images of the river under the morning light are beautiful but the air is chilly and it will cause me a cold on the face. With plenty of pharmacies I will relieve myself with a camphor cream. Time for breakfast, in the same restaurant. Do not imagine eggs with bacon and croissant. 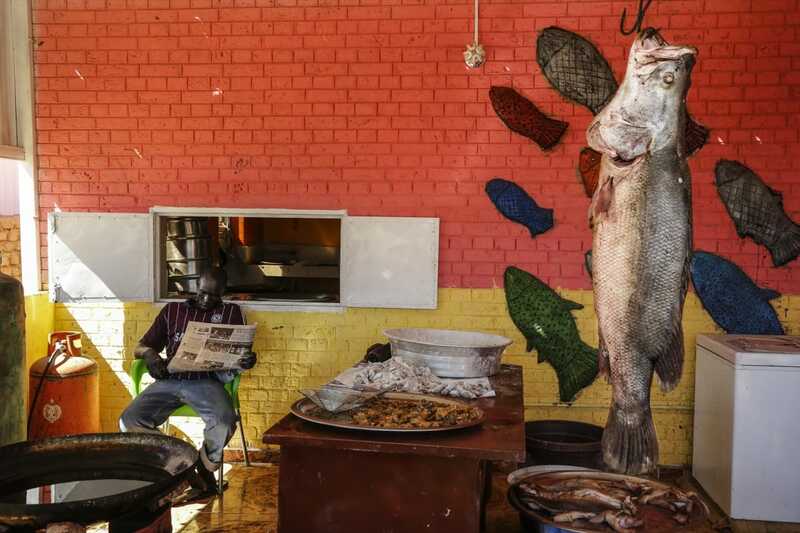 The menu on the Nile includes fish again. 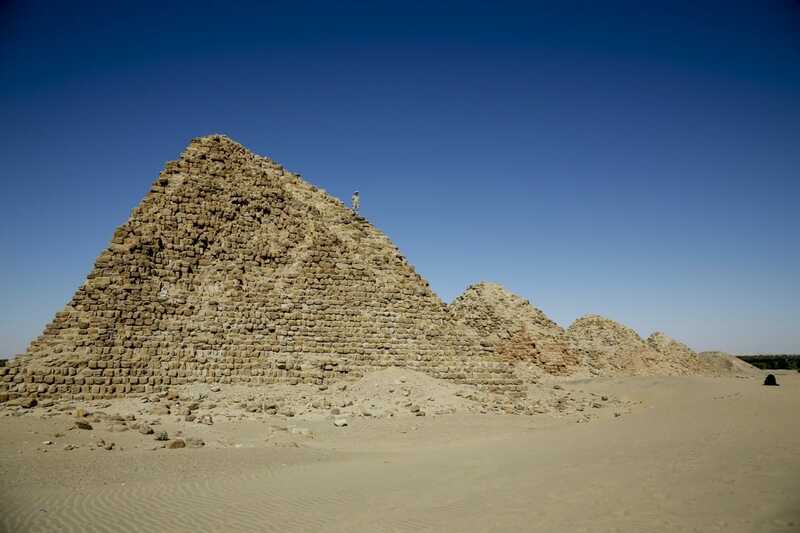 Afterwards we will admire the pyramids on the outskirts of the city, the only hill in the area called Jebel Barkal and we will continue for the nearby El-Kurru where there are some royal tombs of the Nubians. The highlight was an invitation from the hospitable natives to their home where in poor conditions they offered us tea. We, in turn, shared t-shirts in that village too. We continue further north. 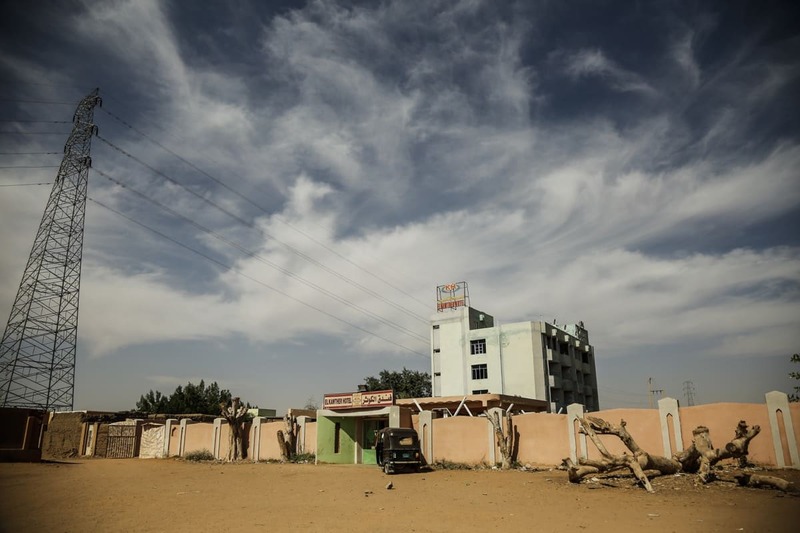 An endless Desert to Dongola, a small town near the banks of the Nile where we arrive at sunset. Searching for a hotel here passed also through frustration. The options are minimal. The first one I saw was a room about 1.5 meters wide, dark, with high ceiling, without windows, with an iron door. If that’s how hotels are, I was wondering how are the Sudanese prisons, challenging my luck. Finally, with the help of the pharmacists of the area, we find something like a hotel. 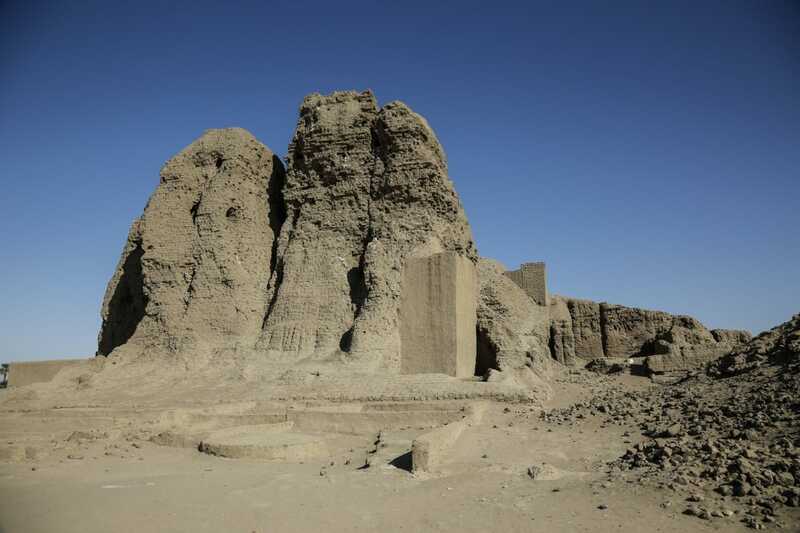 In the morning we continue to the ruins of Kerma, the largest archaeological site in Nubia, 5500 years old (human activity dates back to 9500 years). An extensive urban center lay in this valley as the excavations reveal, including thousands of graves, of which many are believed to belong to wives who were sacrificed together with the deceased. The dominant center of the ancient city is Deffufa, a giant brick temple that at first looks like a mountain. From the height of the building you can enjoy the view of all the ancient city, and the desert that is interrupted by a dense strip of palm trees on the two banks of the Nile. 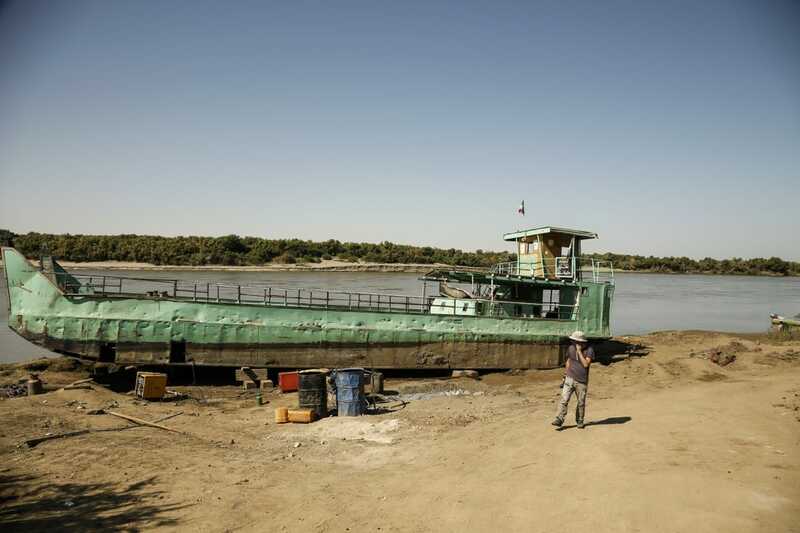 We continue searching for a floating transportation to the opposite bank of the Nile. We are lost in dusty villages with few houses. But nobody speaks English. We stop at a primary school where, as expected, children are excited. Female teachers try to help us but not so effectively. Finally we find a ferry platform but it’s under repair on the bank, resting on woods, while a worker lying under the hull tries to weld the old sheet metal. There is only a small boat for passengers, but without our car, it makes no sense to go across. So, we return south, searching for the Old Dongola. 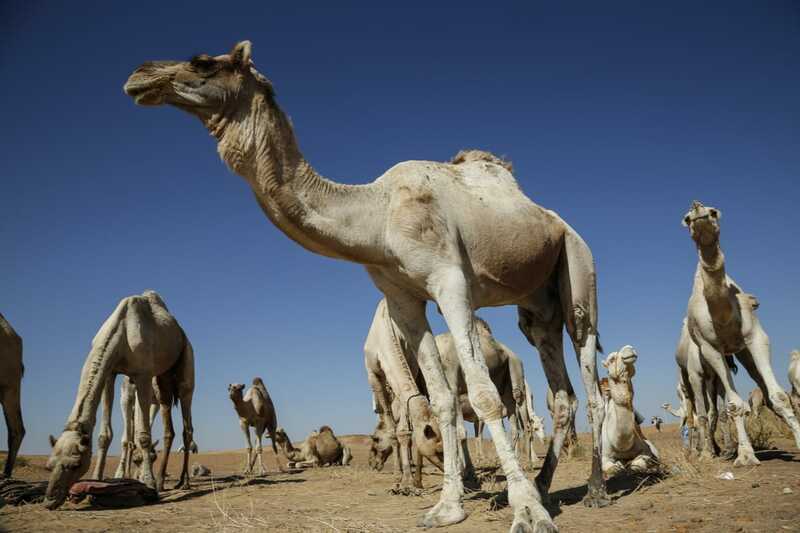 The route crosses a landscape of endless sand dunes and at some point we will meet a big camel caravan where the herders cordially invited us by offering their simple food, prepared in these inhospitable conditions. 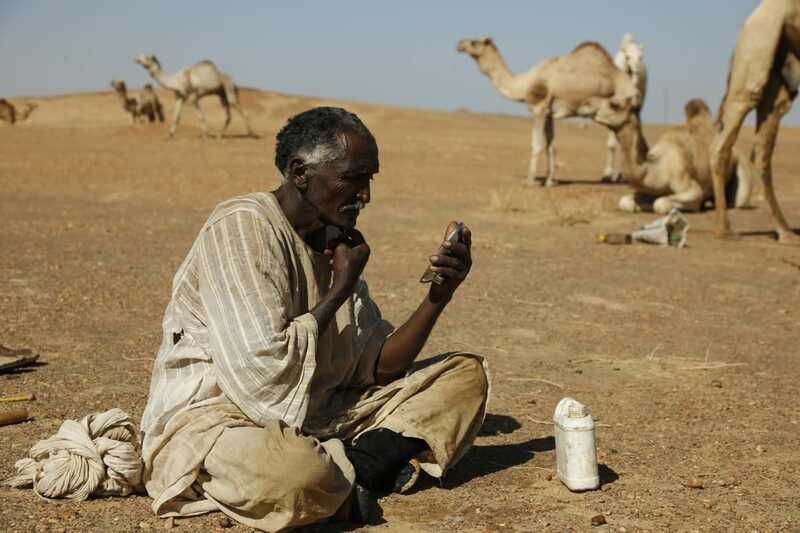 The language gap did not allow us to learn much about them, but according to reports they follow the “40-day road” (Darb al-Arba’in), crossing over 1200km of desert from Darfur to Aswan where the animals will be loaded to their final destination, the Cairo meat markets. 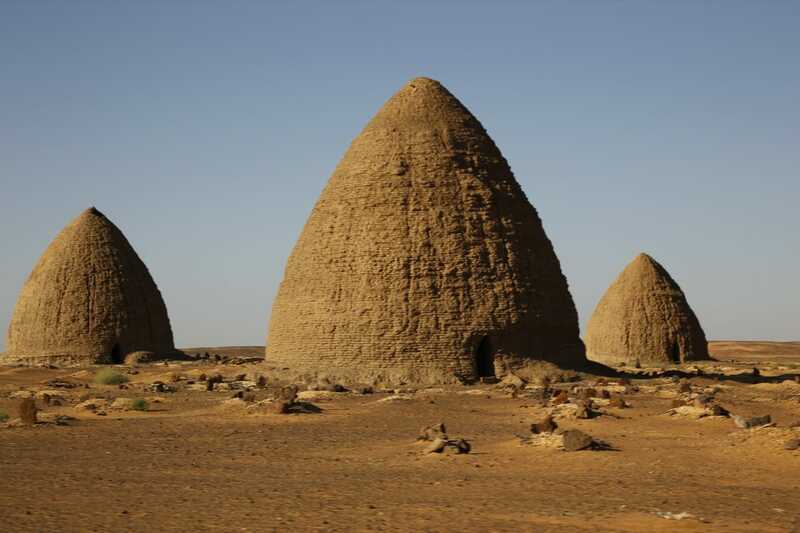 Arriving in the Old Dongola, we see a deserted medieval town that was a caravan station for Darfur. The place is scattered by ruins of churches with granite colonnades, Islamic cemeteries with domes and a fortified palace of the kings of that era in an amphitheatrical location. We also met the only tourists yet, two Germans who intend to cross Africa and whom we offered a lift. 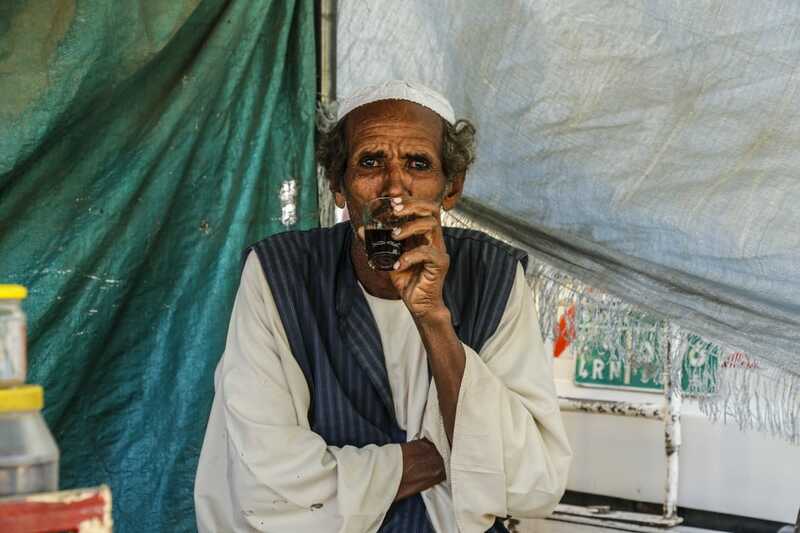 Returning to Karima, we say goodbye to them and we follow the well-known program: Calling the old man with the rooms and trying to communicate for one more time and then dinner at the known restaurant. The following day, we spot on the map the Merowe Dam of the Nile, which will also get us to cross to the river’s other side. We have had to stop in many military roadblocks, employing our diplomacy to persuade them to allow us an approach. After a bureaucratic procedure, we were led to the office of a guy who apparently had not seen visitors in this strategic project. He took to accompany us with a second vehicle and guided us, with a strict ban on taking pictures. The project is gigantic. Megalithic concrete blocks clog the river, creating a lake, while huge hydropower turbines contribute to the energy sources of the countries crossed by the Nile. A coastguard segment patrols so fishermen are not approaching, as there have been several accidents in the past. Continuing on the east bank we drive to Nuri. We see clay huts and strangely surprised people who quickly express their enthusiasm. 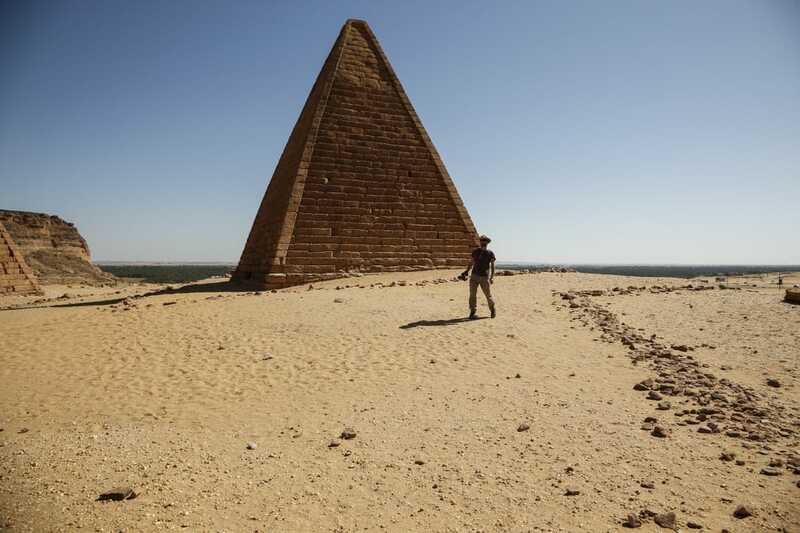 There are ancient pyramids here too but in a state of ruin. The map mentions a monastery in the middle of nowhere, deep in the desert. Following the GPS position in a no-road land, I try to guide us “slightly right-slightly left” until we meet the ruins of Ghazali. 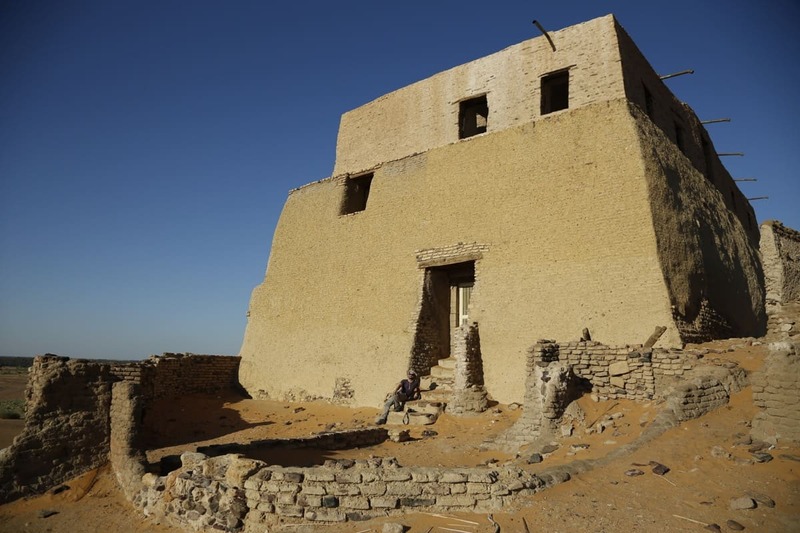 Unfortunately age and desert have occupied the buildings that falter, with the only visitors being the goats of some family in the area. 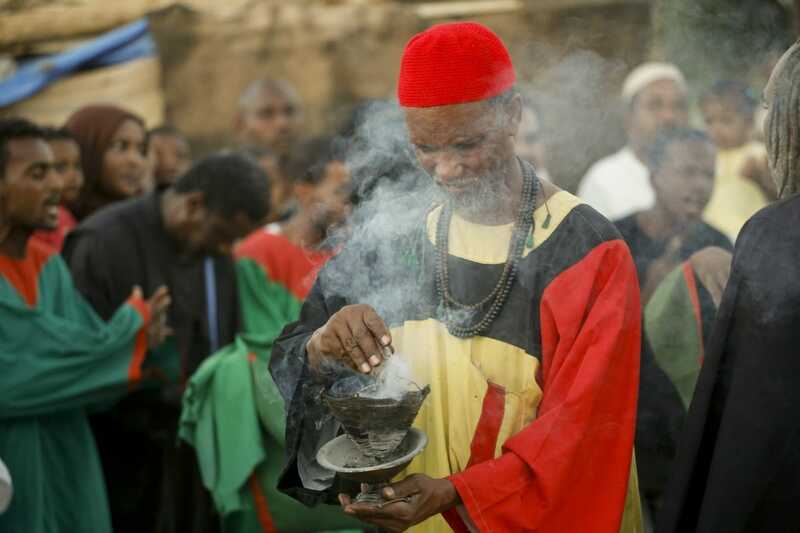 Time is pushing us to return to Khartoum and specifically to the twin town of Omdurman where the Dervish ceremony of Friday is taking place. We will follow a different, shorter return route. The last point of civilisation was a road intersection where we bought a watermelon and interrupted a local’s sleep to supply water and juices. From there and for 350 kms there is only a vast flat desert. 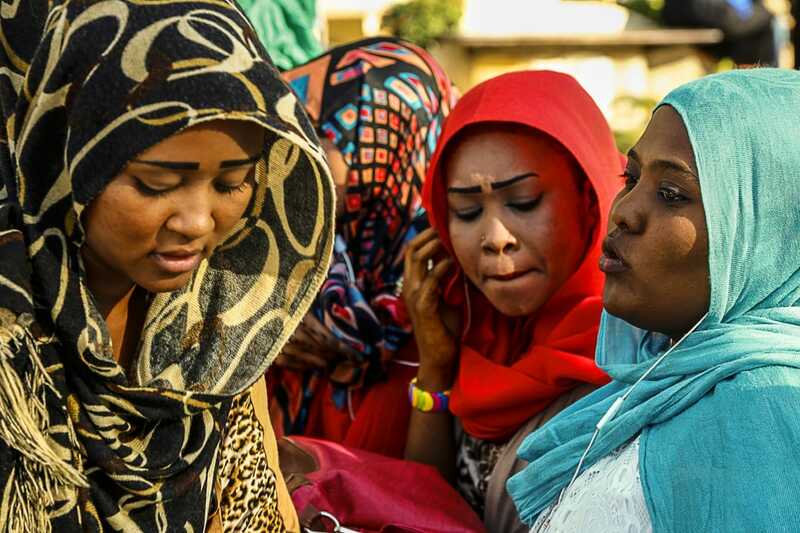 We reach Omdurman marginally at the time of the ceremony and despite the large outdoor area, the large concentration of people and vehicles makes it difficult to park. The rush makes us overlook the fact that we were parking on a cemetery! Here is also the mausoleum of Sheikh Hamed al-Nil, a Sufi spiritual leader of the 19th century. 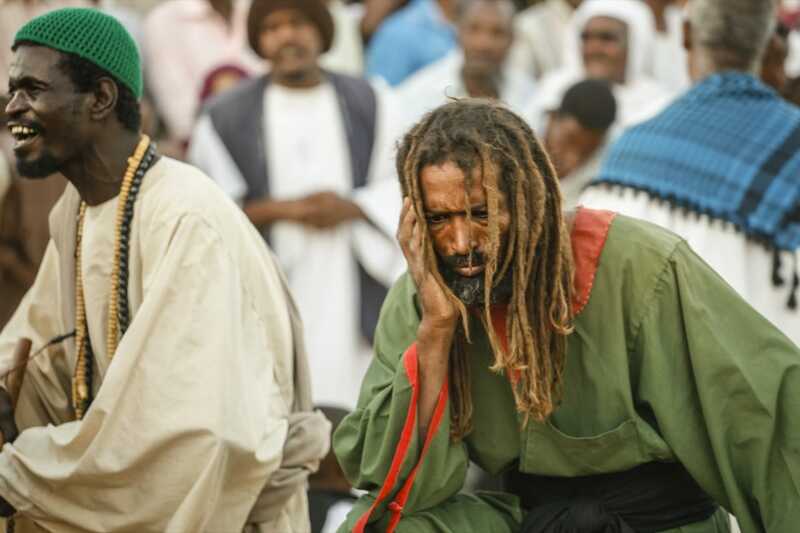 Every Friday afternoon, the Dervishes perform an ecstatic dance. 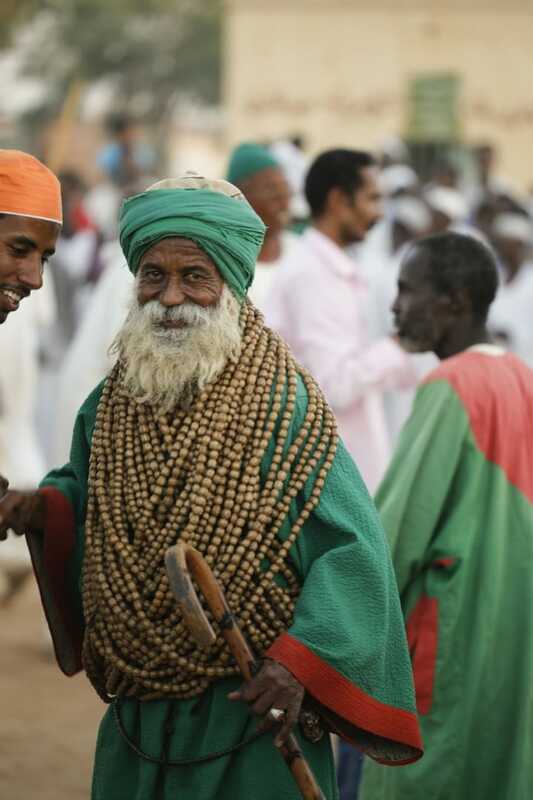 They are dressed in costumes that are very different from typical white robes, with patchworks of green and red, animal skins, necklaces with thick beads and dreadlocks hair. 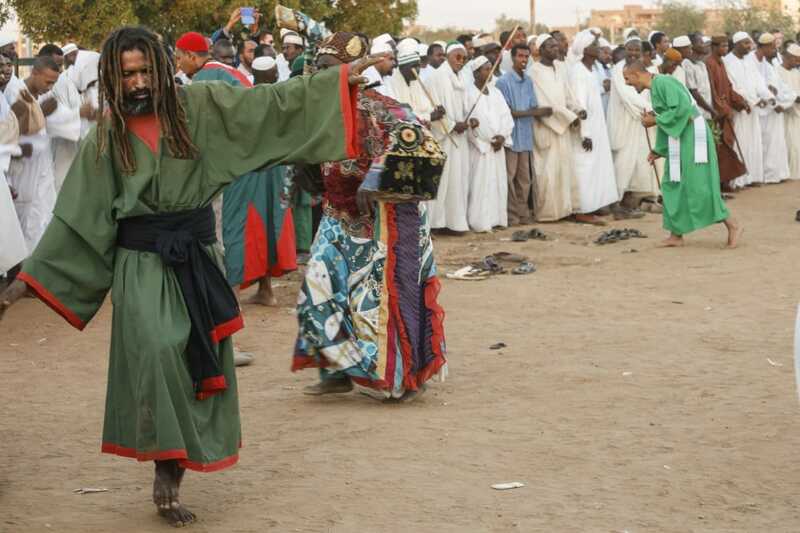 Accompanied by drums, barefoot in the dirt circle and almost hypnotized, they follow the steps of a frenzy dance, repeating the first verse of the Islamic faith statement “La illaha illallah” (There is no other God from Allah). Our departure coincides with prayer time throughout the city, but also an unbelievable traffic chaos that tests our patience and the integrity of the vehicle. 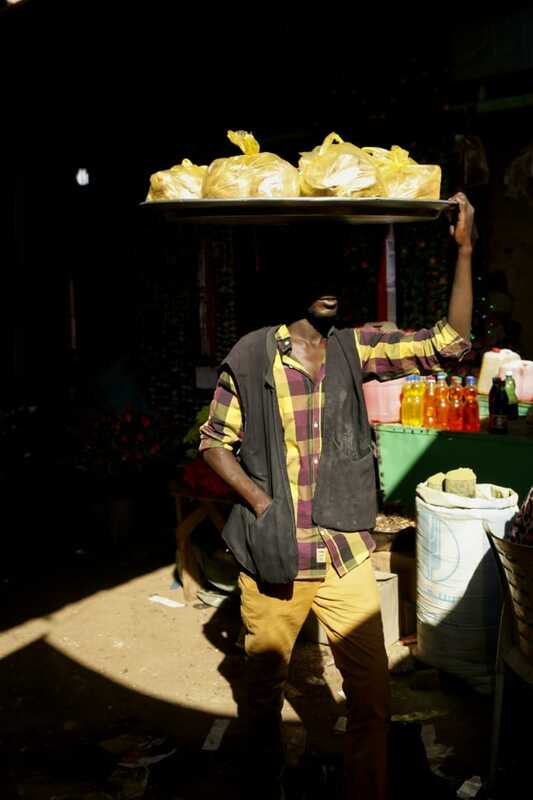 Arriving at night in Khartoum we discover a region with muddy roads but several choices of cheap hotels and restaurants, where the Lebanese cuisine distinguishes. On the contrary, breakfast at the hotel could not meet any expectations. The waiter offered us fresh orange juice, which sounded amazing. I asked him again and again to make sure. I had already drunk half a glass, having realized it was concentrated juice, but a smell of mould confirmed that it was made with Nile water, having same smell as that in the bathroom. “No fresh”, I told him to get the answer: “Yes, yes, fresh powder”. We decide to visit SudanAir offices at the airport to confirm the validity of our handwritten tickets and out flight time. The employee informs us that we are not registered and I am terrified. Initially i thought we were scammed, making sense of the cheap price, or that they were not smart enough just for a simple reservation. After time of agony while the guy was searching on some obsolete computers, the issue is solved. We decided to head south of Khartoum. We arrived in Jebel Aulia, just before another Nile Dam. On route I was photographing some the passers-by. Suddenly a motorcycle appears and closes our way. The rider calls us angrily to get off the vehicle. 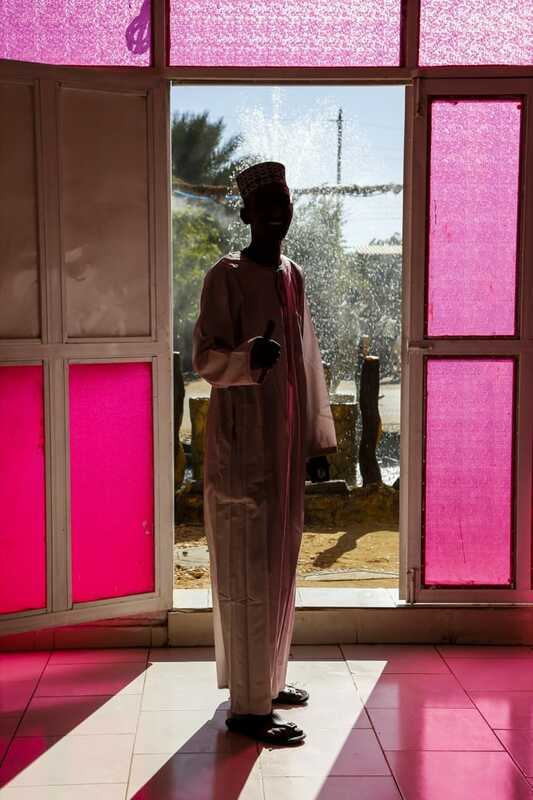 He tells us that he is a security officer, confiscates my camera and asks to follow him. But first she asks me to see the photos. The first picture includes 4 women on the street. This makes him very angry and he raises his fist upon me. Luckily, he did not go on, luckily because I was ready to answer him in the same way. He carries the camera with the belt on one shoulder and fortunately I correct it by asking him to cross wear it. When he starts the motorcycle, he fells down to the ground with my camera. I’m raving, I start shouting at him and I hardly I restrain myself from punching him. We follow him in the police department in a very tense mood. Without any information or accusation and without the camera in our hands, we are waiting for at least 4 hours worrying mainly about the future of photographic equipment and less about the future of our arrest. This time we will talk on phone with the governor who once again was very gentle and commanded our release. 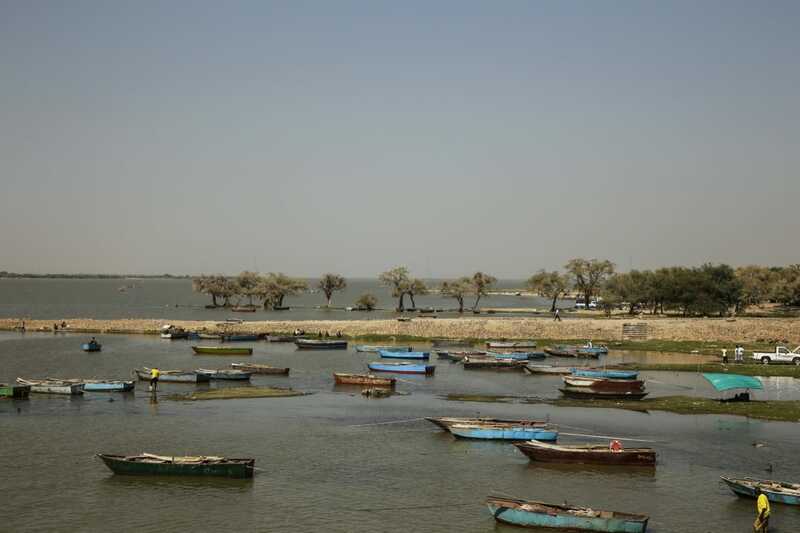 We continue our journey passing the dam road on the opposite side shore full of colorful fishing boats. 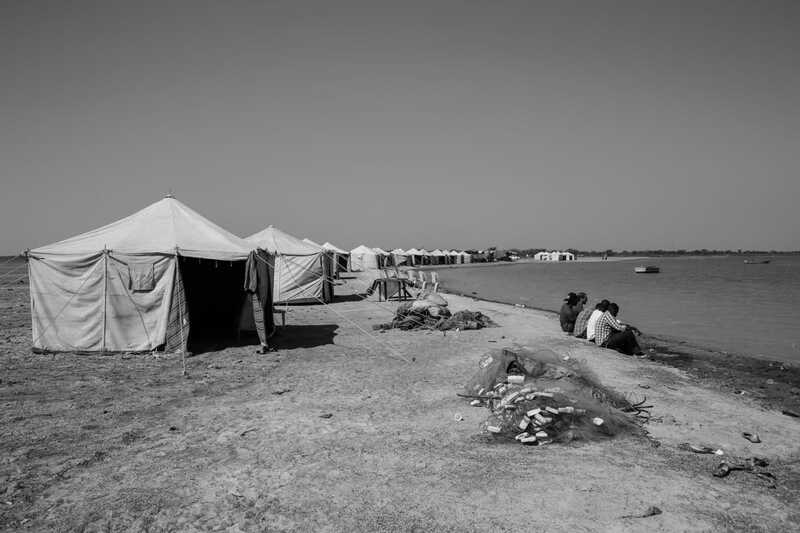 It’s a place of recreation for the locals and especially for the youngsters who were joying under tents drinking tea. Our public relations once again escalated with particularly hospitable dispositions and social media name exchanges. Ηowever τhe owner of the car, asked us to return the car earlier, so we took the road back to Khartoum. On the last day we will be on foot and public transport. We will cross the Nile bridge and we will take more photos ignoring reports of arrests in that area. We will bargain for boat rides at the rivers’ junctions, we will visit an adjacent mosque by jumping the fence to cut way and in general we will feel the city as our hometown. I will argue with a tuk-tuk driver (I have a tradition on it) because he was demanding the full agreed fare until Omdurman but his route was finished on Nile Bridge as there is a restriction for tuk-tuks. 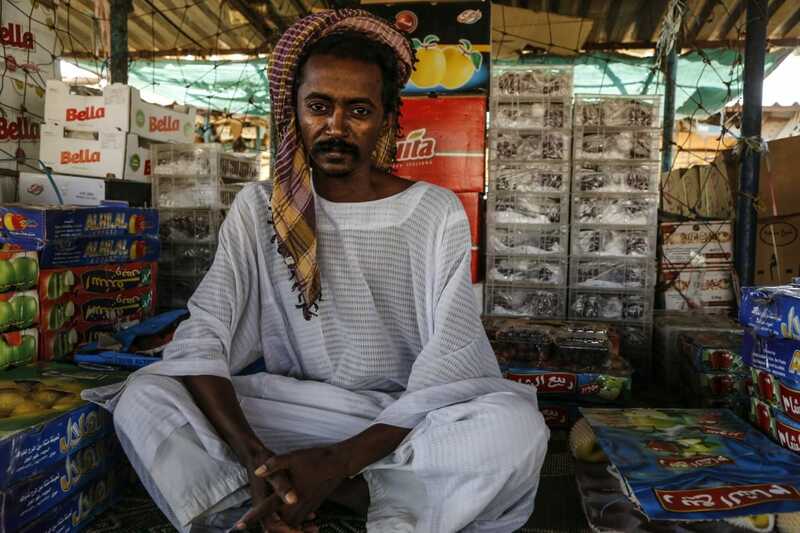 Eventually, we will end up in the famous Omdurman market, the largest of East Africa, where you can find from vegetables, Chinese electronics to crocodile skins. Inside the chaotic market we will fill will pictures and … a lot of dust. 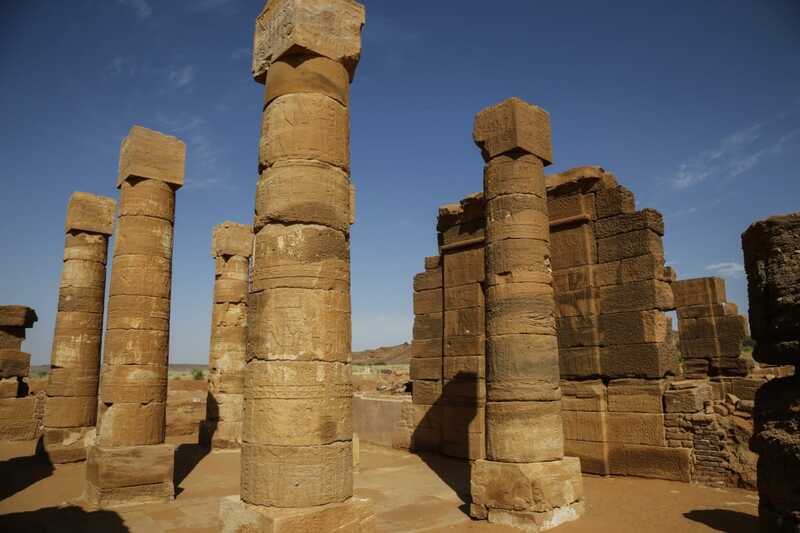 Arriving at the end of the trip, we will complete the experience with the archaeological museum of Khartoum and the wonderful masterpieces of all Nubia time periods. Here we also met a group of elderly tourists. 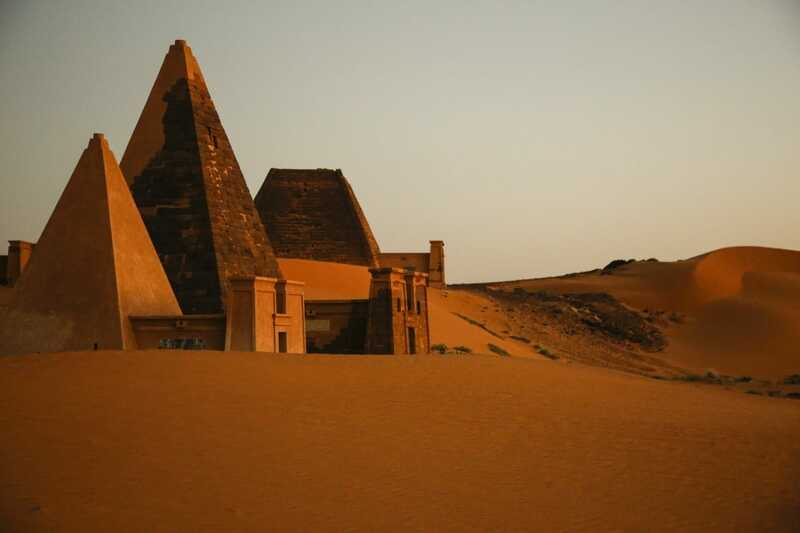 Recalling the moments in this country, I will value Sudan as a destination that doesn’t resemble to any other, combining ancient heritage with the magic of the desert, the Islamic culture with the African element. 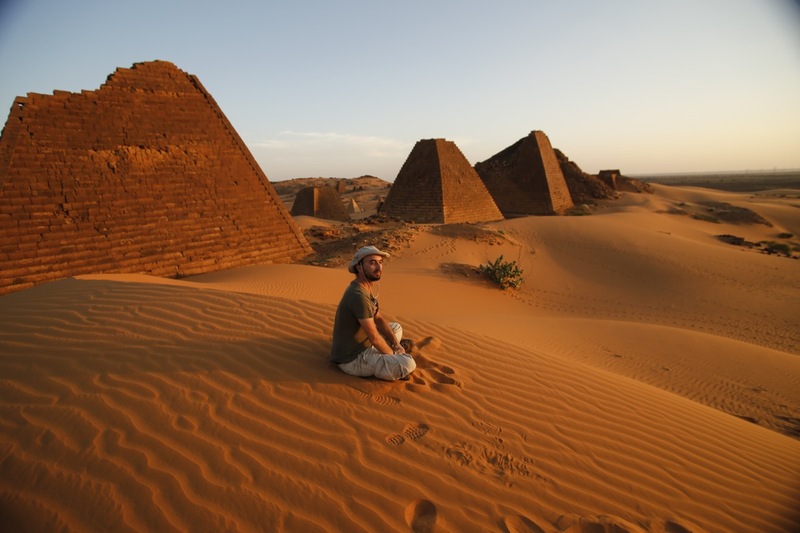 Sudan’s position outside of the tourist map, offers an definitely authentic experience. 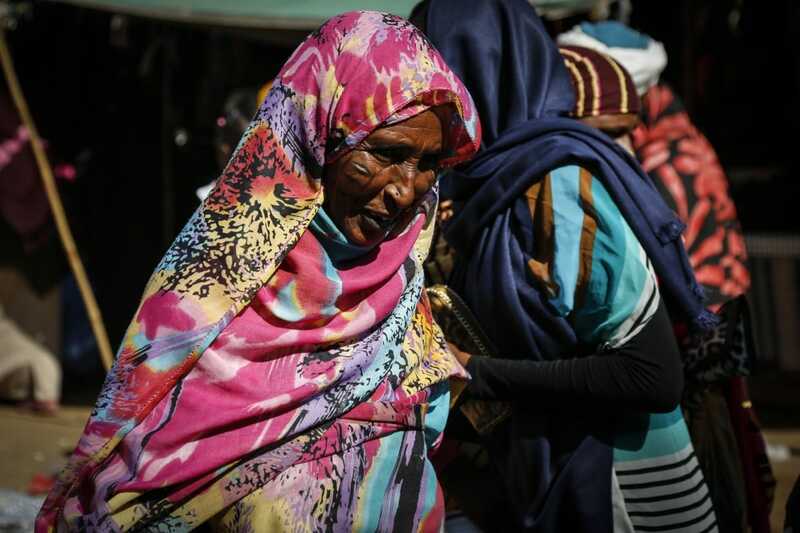 We say goodbye to Sudan, heading to Addis Ababa with a 5-hour flight, in a plane where all passengers are repatriated illegal immigrants, one of whom had mental illness and was cruelly attached to the seat.